Hampton Inn & Suites Aurora is the ideal destination for travelers spending a day at Raging Waves Waterpark, Chicagoland's newest and largest outdoor waterpark located in suburban Yorkville, Illinois, on Highway 47. This Australian-themed waterpark offers a water ride for every waterpark enthusiast including 17 different water slides, a family-tube ride and speed slides. When looking for more excitement, there are thrills to be had when "flushed" into a bowl on The Cyclone, dropped into a funnel on The Boomerang, or flown 2,000 feet across the park on The Cowabunga Zip Line. Feel the adrenalin rush! Then relax and unwind while floating around The Kookaburra Kreek Lazy River or take on body-surfing in The Great Barrier Reef Wave Pool. Don't forget the little ones! Koala Kove splash area is the perfect playground for younger children with shallow pools and smaller slides. 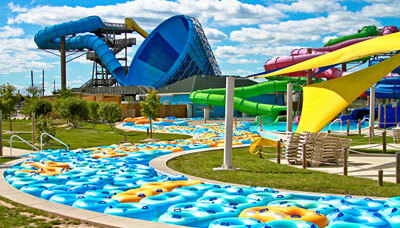 Move over to Kangaroo Falls and explore the four-story water fort with the entire family. Finally, take in a daily presentation at Sea Lion Splash, the newest attraction featuring sea lions that will dance, perform tricks and so much more! There's endless fun to be had at Raging Waves Waterpark...your Australian Adventure Awaits! Raging Waves Waterpark is open from Memorial Day weekend through Labor Day weekend. For more information on events, park hours and ticket prices, call (630) 882-6575 or visit ragingwaves.com. Hampton Inn & Suites, a conveniently located hotel in Aurora, Illinois, is just off I-88 and is only 10 miles from Raging Waves Waterpark.